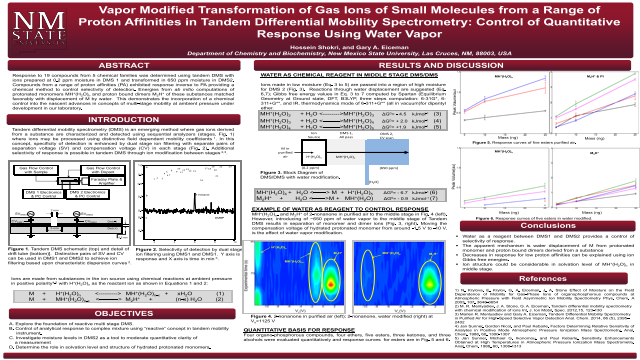 Abstract: Response to 19 compounds from 5 chemical families was determined using tandem DMS with ions prepared at 0.2 ppm moisture in DMS 1 and transformed in 650 ppm moisture in DMS2. Compounds from a range of proton affinities (PA) exhibited response inverse to PA providing a chemical method to control selectivity of detection. Energies from ab initio computations of protonated monomers MH+(H2O)n and proton bound dimers M2H+ of these substances matched favorably with displacement of M by water. This demonstrates the incorporation of a chemical control into the nascent advances in concepts of multi-stage mobility at ambient pressure under development in our laboratorySummary: Water as a reagent between DMS1 and DMS2 provides a control of selectivity of response. Decreases in response for low proton affinities can be explained using ion Gibbs free energies. Ion structure could be considerable in solvation level of MH+(H2O)n in middle stage.